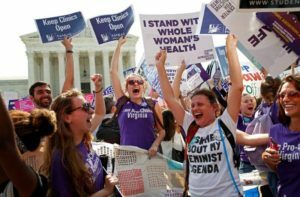 Abortion restrictions imposed by the Texas Legislature in the name of women’s health should have never made it to the U.S. Supreme Court. No matter what side of the abortion debate you are on, the dirty little not-so-secret behind regulations thinly wrapped inside a facade of improving women’s health was clear from the beginning. Unable to outright ban abortion, those opposed concentrated on what some openly referred to as “the next best thing,” erecting barriers to access. Years ago, and sometimes still today, those barriers were literal, amounting to lines of demonstrators who aimed to keep women out of health care facilities that provided abortions. They’ve also been psychological, like the published lists of home addresses and telephone numbers or photographs of clinic workers and doctors who perform abortions. Perhaps at their worst, “the next best thing” has been carefully constructed lies, like the unethically edited videos circulated last year in an attempt to rile the masses about a federally-approved organ and tissue program and specifically discredit an organization that supports access to abortion. Beyond all of these ideologically-driven barriers, however, are state laws originating from national think tanks that cited non-existent health concerns as a reason to further regulate and restrict doctors and facilities engaging in abortion services. Lawmakers said whatever they needed to say, even when they had no evidence to back up their claims, in order to pass onerous laws developed and intended to limit access to a medical procedure they religiously or morally opposed. The Texas law specifically targeted doctors, who were required to have privileges at a hospital within 30 miles of their office, and facilities, which were required to meet the elevated regulations imposed on surgical centers. And, with only one aspect of the law going into affect, disingenuous lawmakers received the result they wanted: roughly half of 40 abortion providers across Texas shuttered their doors. The court estimated that if the facilities provision went into effect, the number of clinics would drop to 7 or 8, concentrated in metropolitan areas. “The requirement’s purpose is to help ensure that women have easy access to a hospital should complications arise during an abortion procedure, but the District Court, relying on evidence showing extremely low rates of serious complications before (the law’s) passage, found no significant health-related problem for the new law to cure,” Justice Stephen Breyer wrote in the majority opinion. In other words, Texas lawmakers set out to fix a problem that didn’t exist. Instead, their law created problems. No doubt in the wake of this Supreme Court ruling, you’ve seen some lament the country will face more people like discredited Philadelphia physician Kermit Gosnell. Well, the state of Texas argued that point with the court. Texas law already contained numerous regulations for abortion facilities, including a mandate they be inspected annually. “The record contains nothing to suggest that H.B. 2 (the new Texas law) would be more effective than pre-existing Texas law at deterring wrongdoers like Gosnell from criminal behavior,” he added. Regulating abortion clinics like surgical centers produces no health benefit for women, the Court found. In fact, women who have abortions at surgical centers experience complications at the same low rate of those who have abortions in a clinic setting. And, perhaps the final straw for Texas lawmakers’ assertions that they were acting out of concern for women’s health came when the Court noted that the state provides either full or partial waivers to about two-thirds of the facilities that are required to meet surgical center standards. No such consideration was afforded to facilities that perform abortions. The final word to state lawmakers — and the think-tanks that seek to alter the national landscape to fit their narrow ideologies — is to show their work. If a state law is passed for the expressed and legitimate state interest of advancing public health, there should be scientific or reality-based evidence to back up the claim. The Texas law, as well as similar debated and defeated in the Iowa Legislature, were not to combat health risks. It shouldn’t have taken a Supreme Court decision to tell us what we already knew.